For many years a leading authority on socially correct etiquette from birth to burial, Emily Price Post provided solutions to social problems. With a name synonymous with proper manners, she was a successful author, daily newspaper columnist, and radio commentator. Born into a wealthy, socialite Eastern family, the date of birth variously reported as October 3, 27, or 30, 1873, Emily Price was the only child of Bruce Price, a distinguished Baltimore architect, and Josephine Lee Price. She was educated at home and attended Miss Graham's finishing school in New York where her family had moved. She grew up in an era of footmen, servants, chaperones, and cotillions. A popular debutante, she married society banker Edwin Main Post in 1892 and had two sons, Edwin M. Jr. (1893) and Bruce Price (1895). The Posts drifted apart, and although society frowned on divorce at that time her husband's infidelity caused the marriage to end in a divorce in 1905. She asked no alimony since there had been a small crash in the stock market in which her husband had suffered a severe financial reversal. To supplement a small income and support herself and her sons, Emily Post wrote short stories which were published in the popular fiction magazines Ainslie's and Everybody's. She also produced several novels, the first—The Flight of a Moth—about a young American widow attracted to an unscrupulous Russian nobleman, which was published in 1904. As a successful writer and a woman of social position she was encouraged by an editor at Funk and Wagnalls publishers to write a book on etiquette. Emphasizing the social graces, she wrote Etiquette—The Blue Book of Social Usage. First published in 1922, it quickly became a best seller, going through ten revisions and 89 printings and bringing her fame and fortune. Post's guiding precept was that good manners began with consideration for the feelings of others and included good form in speech, knowledge of proper social amenities, and charm of manner. She believed that there was a right or best way to do almost everything and that that was the way that pleased the greatest number of people and offended the fewest. Before her book had been out a month readers deluged her with questions the book had not addressed, and these formed the basis of later revisions. Originally written for the newly rich who presumably wanted to live, entertain, and converse like the wealthy, the heroine of later editions was "Mrs. Three-In-One, " a wonder woman who performed the functions of cook, waitress, and charming hostess at small, informal dinner parties without a maid. Post also started a syndicated column of questions and answers which appeared in 150 newspapers and received as many as 26, 000 letters annually at her New York office in addition to those sent to newspapers in other cities. During the 1930s she had her own radio program three times weekly which continued for eight years. Although her advice on social behavior changed over the years, her Victorian upbringing made her reluctant to part, in later editions of the book, with the chaperone. She adhered to an earlier convention that considered it improper to visit a man alone in his apartment or to go on overnight automobile trips. Her "Blue Book, " which was the American standard of etiquette for decades, was reported to be second only to the Bible as the book most often not returned or stolen from libraries. 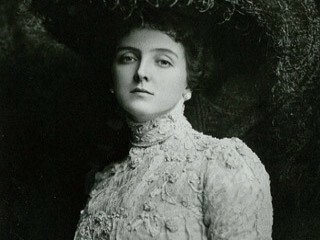 Emily Post maintained her social position, travelled extensively in Europe, and always spent the hot summer months away from New York City at a home in Tuxedo Park, New York (designed and built by her father) and later in life at Edgartown, Martha's Vineyard, in a summer home she remodelled. Besides her writings on etiquette, she wrote The Emily Post Cook Book (1951); The Personality of a House (1930), partly based on her experiences rebuilding and remodeling her summer home at Martha's Vineyard; Children Are People (1940), much of it derived from hours she spent with her grandson; How To Behave Though a Debutante (1928); and other books. In 1946 she formed the Emily Post Institute to study problems of gracious living and relinquished a great deal of her work to the staff of the institute, headed by her surviving son, Edwin. She remained active throughout her life, awakening early, but remaining in bed to devote time to letters and the daily column. She always made her first appearance of the day at luncheon, which was served promptly at one. The arbiter of American etiquette, whose name became a household word, died in her New York apartment on September 25, 1960, at the age of 86. View the full website biography of Emily Price Post.